Moonbox Productions will present "Of Mice and Men," written by Pulitzer-Prize winning author John Steinbeck, from December 7 - 22 at Boston Center for the Arts Plaza Theatre. "Of Mice and Men" marks the fourth production, and first non-musical, for Moonbox, with Dan Rodriguez composing and debuting new incidental music for the show. The cast includes Phil Tayler and Phil Thompson, both of whom appeared in Moonbox’s April production of "Floyd Collins," along with Erica Spyres, Ed Peed, Harry McEnerney, Calvin Braxton, Glen Moore, Jordan Sobel, Tom Shoemaker and Steven Emanuelson. 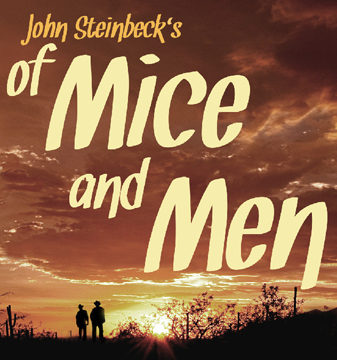 Steinbeck’s drama tells the story of two drifters, George and Lennie, as they struggle for survival and chase their dreams in Depression-era California. The pair have landed a job on a ranch where it seems that their dream of earning enough money to buy their own place might finally come true. But Lennie's dangerous simple-mindedness and propensity for getting into trouble threaten to undermine their hopes at every turn. Although it is very much a period piece, the themes explored are both timeless and timely. George and Lennie are companions struggling to survive in hard economic times, with their hearts set on someday achieving the American dream of personal and financial independence. Aside from its economic themes, the themes of racism, sexism and social bias that comprise the many layers of Steinbeck’s play are as potent today as they were day the piece was written. "Of Mice and Men" is a work that reaches the deepest places of what makes us human and challenges us to examine ourselves and our relationships to our world. Moonbox Productions was founded in 2011 by Producer-Artistic Director Sharman Altshuler. Based in Harvard Square, the company is dedicated to supporting local arts and local artists, and to connecting communities to the non-profit organizations that serve them.